In this stunning historical novel, Mary Sutter is a brilliant, headstrong midwife from Albany, New York, who dreams of becoming a surgeon. Determined to overcome the prejudices against women in medicine—and eager to run away from her recent heartbreak—Mary leaves home and travels to Washington, D.C. to help tend the legions of Civil War wounded. Under the guidance of William Stipp and James Blevens—two surgeons who fall unwittingly in love with Mary’s courage, will, and stubbornness in the face of suffering—and resisting her mother’s pleas to return home to help with the birth of her twin sister’s baby, Mary pursues her medical career in the desperately overwhelmed hospitals of the capital. Like Charles Frazier’s Cold Mountain and Robert Hicks’s The Widow of the South, My Name Is Mary Sutterpowerfully evokes the atmosphere of the period. Rich with historical detail (including marvelous depictions of Lincoln, Dorothea Dix, General McClelland, and John Hay among others), and full of the tragedies and challenges of wartime, My Name Is Mary Sutter is an exceptional novel. And, in Mary herself, Robin Oliveira has created a truly unforgettable heroine whose unwavering determination and vulnerability will resonate with readers everywhere. My Name Is Mary Sutter is a remarkable book, one of the most assured first novels I’ve read in a long, long time. Robin Oliveira brings the Civil War era vividly alive, and her heroine is a character who, once encountered, few readers will forget. Bravo! 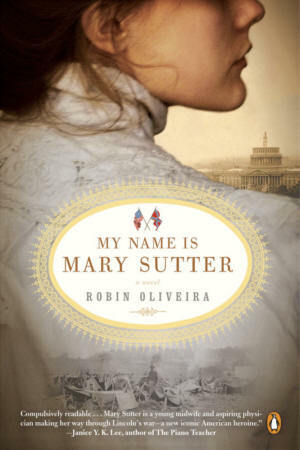 In MY NAME IS MARY SUTTER it seems as though Robin Oliveria brought Mary Sutter back to life rather than imagined her. With her description of the Sutter home, the reader becomes a guest at the dinner table. This is a finely written novel of the medical failings and opportunities presented by the war. But it is really the story of a woman who lives her life with the passion and stubbornness needed to take her through the strains of battlefield hospital work, through her grief for family loses and the war wounded; it is the story of the extraordinary need that propels her to become a surgeon. Even in the darkest days, Mary’s enormous compassion and healing touch shine forth. Thank you so much for sharing it with me. Oliveira’s voice is urgently compelling in its detail and so authentically pitched, she might have been transported directly from the tumult of Civil War Washington to report this story. I am deeply impressed by MY NAME IS MARY SUTTER. Oliveira weaves the strands of civil war history, history of medicine into a novel with dynamic and believable characters. Mary is a wonderful heroine, with extraordinary gifts and weaknesses too. That every man is in love with her is no wonder. A thrilling debut.